The cultural origins of digital storytelling as a video-based practice of short digital personal stories is often situated in the Bay Area of California around the mid-1990s community arts practice of Dana Atchley (at the American Film Institute), Denise Aungst, Joe Lambert, Nina Mullen and programmer Patrick Milligan (see Lambert 2006, 8-10, cited in Hartley and McWilliam 2009, 3). While community-based video projects existed prior to their work in the 1990s, their creation of a transportable workshop model of training and production distinguished their group from earlier projects. Their workshop framework was codified by the Center for Digital Storytelling in Berkeley, CA (see Hartley and McWilliam 2009, 3). The model of the digital story taught through the Center inspired other digital storytelling practices in the UK with the BBC’s “Capturing Wales” program, the Australian Centre for Moving Images, Silence Speaks (an offshoot of the Center in Berkeley that develops digital storytelling pedagogies around survivor experiences of sexualized and gendered violence), the “Men as Partners” project in South Africa (a joint effort with Silence Speaks), and a Brazilian program at the Museum of the Person (Museu da Pessoa), among others. As Elisabeth Springate (2012) argued, the dominant genres of digital storytelling and their training protocols follow a recipe, codified in such texts as the Center for Digital Storytelling’s Digital Storytelling Cookbook from January 2010. Springate analyzes how cooking became a powerful metaphor of digital storytelling production. The Center's text, for example, presents simple steps their trainees follow in order to create a digital story. Using the metaphors of cooking and following recipes to describe digital story production and the space of the kitchen to define the digital storytelling workshop and its technologies, Springate suggests that most approaches to digital storytelling production treat it like a craft that can be broken down into simple steps, where the recipe represents “cookery’s technical expression.” According to Joe Lambert, Director of the Center for Digital Storytelling, the cookbook “breaks the digital story down into a recipe with ingredients…that will help you to prepare it all again” (2010, v). That is, one can create different digital stories from the same recipe, what Thenmozhi Soundarjan referred to in our interview as the model's "efficiency" (Soundarajan interview, February 18, 2015). 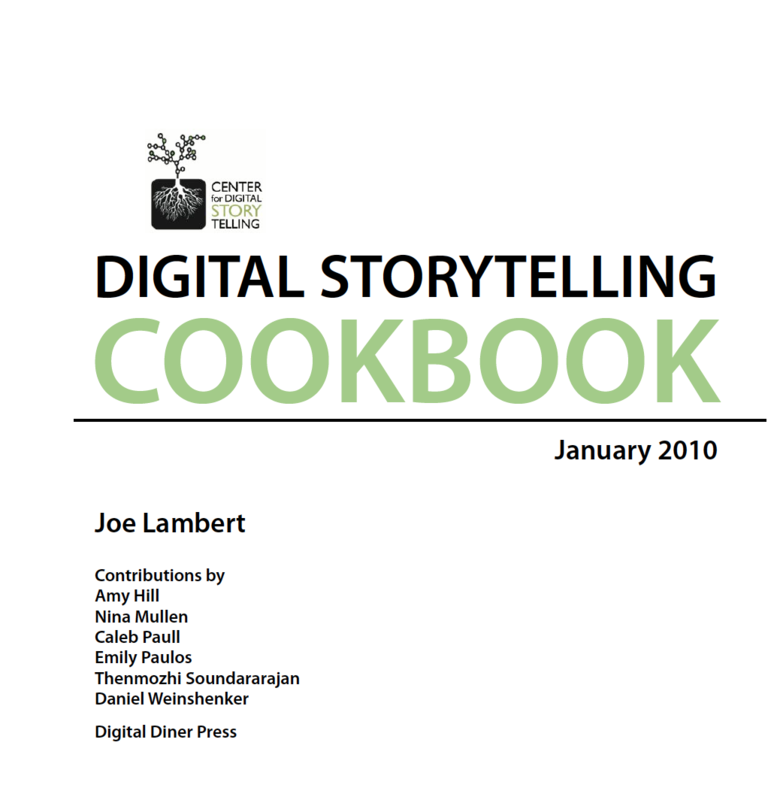 In their training on how to use the video editing software Final Cut Express, the Cookbook refers to the Timeline feature where digital storytellers arrange sound and video clips as their “mixing bowl” (2010, 63). Texts such as the Cookbook associate digital storytelling with other forms of do-it-yourself crafting, emphasizing a maker-culture context for the digital storytelling workshop, one whose aim is to provide the tools for speaking one's own personal truths in this organization's framework. For the Center for Digital Storytelling, the digital story enables community-specific forms of emotional disclosure, a way to create narratives in which “the stories feel like they are traveling from the heart of the storyteller to the viewer’s own heart” (Lambert 2010, 13). In this model, digital stories are meant to communicate emotional honesty. As described in the Cookbook, their practice “is predicated on providing a safe space for telling and listening to emotionally honest stories” (13). Even as digital stories vary in theme, in the Center for Digital Storytelling model their consistency lies in their emotional honesty (13). Much of the Cookbook emphasizes a therapeutic quality to digital stories, where “storytellers choose to address difficult issues – to wink, stare and sometimes engage, the demons inside” (13). They delineate several different kinds of personal stories that digital storytellers might want to tell, from personal stories to memorials, adventures, accomplishments, stories about places in one’s life or one’s work, to narratives about love, recovery and discovery (2010, 5-7). For Lambert, digital storytelling is akin to other forms of activist- and community-based video projects, and “speaks a language that is attractive to vast numbers of people raised on screen culture” (Lambert 2009, 85). We start with point of view, because we believe everyone should know that they have one. Even if our efforts are just showing people a way to take responsibility for their own lives, their own stories, as the first step to larger awareness, all our choices are informed with a touch of the subversive. It is subtle, or not so subtle, an indirect or not so indirect confrontation with the dominant culture and representative authorities which is driving the bus of our planet off of the precipice. We cannot afford to be naïve or pluralistic to the point of pointless (2009, 82). Similarly, for media scholars John Hartley and Kelly McWilliam, in addition to social networking tools such as YouTube, “the digital storytelling technique adds individual imaginative vision, a ‘poetics’ of expression, and the necessary technical competence, offering people a repertoire of creative skills to enable them to tell their own unique stories in a way that captures the imagination of others – whether close family members or the whole world” (2009, 4). One example story appears in the Center’s Cookbook, a story called “Momnotmom” by Thenmozhi Soundarajan, former Community Programs Director at the Center who then became a founder of Third World Majority. In it, Soundarajan tells the story of her mother’s experiences immigrating to the U.S., her former life as a doctor, her roles as mother and wife, and their relationship as mother and daughter. The book also credits Soundarajan with developing the tutorial the Center for Digital Storytelling uses to train people in how to tell their own digital stories. Soundarajan's activist work and training in Third Cinema helped establish a different set of methods for doing digital storytelling differently. Third World Majority oriented the tools of digital media making toward a more explicitly transformative vision of justice that I discuss in the next section of this essay.